We had some friends over for dinner on Tuesday night. They were coming at 7 pm. I got home at 6:15. 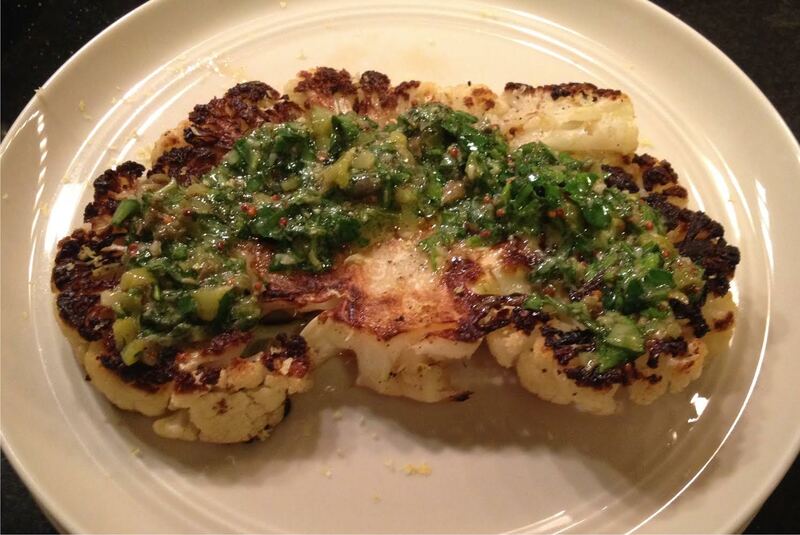 I thought that getting home so late might happen so I had set the table the night before and had planned an easy dinner of grilled Cauliflower Steaks with an herb salsa verde as a first course (divine), followed by roasted sumac chicken stuffed with fennel stalks and Parmesan cheese rinds, roasted baby Yukon Gold potatoes and roasted tomatoes with olive oil and Greek oregano. Simple, yet if done right, perfectly delicious and comforting after a full days work on an early fall evening. Paired with a Petit Syrah and we were set! Now you all have seen my kitchen in our videos. It is a galley that is completely open to the living room. With a small gathering, our guests sit right across the counter from me while I’m cooking, and literally see everything. So all is going well until I start to open the organic chicken package only to discover that it’s not a whole chicken! It is chicken parts, and badly cut at that, yet they had put it together in the package to appear as a whole bird!! Well I was surprised, flustered, and of course, a little ticked off at my husband, as he picked out the meat that shopping trip. (I had to blame it on someone!) So now, in my head, I was scrambling, what was I to do? I was searching for something with great flavor to work with, quick, at that late hour. What did I have? No pancetta, which is a great way to add some big flavor in no time. There was no time to make a tomato sauce, no nice savory jams in the fridge. No mushrooms on hand and no time to caramelize onions. Really, my mind was racing while making small talk to my guests sitting right in front of me! So I thought to start with a little butter and olive oil, instead of just the oil. Salt and pepper on the skin side, added a sprinkling of cumin on the other side. White wine is always good and then I smeared some Dijon mustard on top. Then I saw this box of dried fruit on the counter to the left of my stove. I had just bought it last week to serve with some lovely cheeses, but that never happened. So I thought, what the heck, let’s try this. 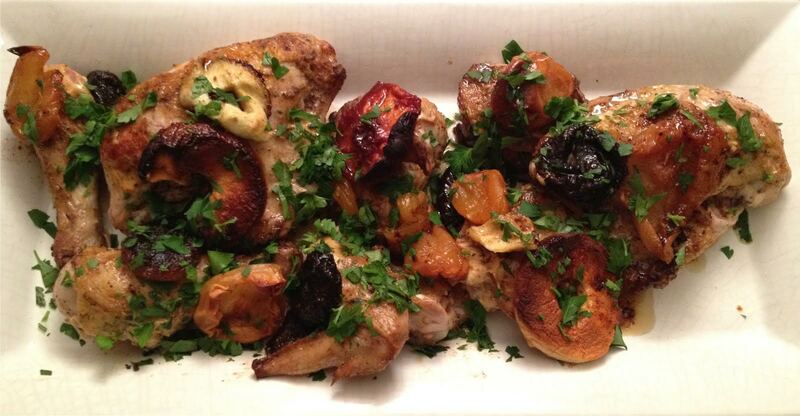 I topped each chicken piece with slices of fruit – apricots, apples, peaches, pears and prunes, and then threw the whole thing in the oven for about 17 minutes and voila, it was divine! And the oven was hot – 450 degrees for that roast chicken that wasn’t to be – so the fruit got golden and beautiful and dinner was saved. This new recipe is good enough to share, good enough to repeat, and different too! The only thing was that the roasted tomatoes with oregano sort of no longer went with the other food – but they tasted good with the potatoes! Has this sort of thing ever happened to you? Please share. Wash and dry the chicken pieces, all fat and extra skin trimmed off. Salt and pepper skin side. Warm olive oil and butter on medium high heat. Swirl to combine and when butter stops sizzling, place the chicken in the skillet, seasoned side down to brown and crisp skin for 3 – 4 minutes. While that side is browning, season the top side with salt, pepper and cumin. After the first side is nicely browned, turn chicken pieces over and brown the other side for two minutes, then add the white wine and spread the mustard on top of each piece. Then place 2 pieces of dried fruit on top of each lightly mustard coated piece. Put 2 – 3 pieces of fruit on each of the breasts, depending on the size of the fruit. You want to essentially cover the top of the chicken. Place the skillet in the oven and roast for 15 – 18 minutes. Check doneness with a thermometer – should be 160 – 165 degrees. Remove chicken pieces to a platter, keeping the fruit on top. Pour any juices left in the skillet on top of the chicken. Let rest for 10 minutes and sprinkle chopped parsley on top and serve with LOVE. I had a dinner party this past Wednesday night that was so much fun. One of my senior designers who worked for me years ago, I think back in the late 80’s, was in town and got in touch. She now lives in Singapore. She connected with another former designer and I got in touch with Carl, who was the second person I ever hired for the firm in the early 80’s. So with other friends, we were 8 people in total and three were past employees of PM+CO! It was just great catching up. Linda is a vegetarian and I wanted to make sure the whole meal was amassed with local farm vegetables from upstate, to bring great country flavors to a NYC dinner party. So I started with a salad of farm lettuce and arugula from my garden, topped with roasted beets, Coach Farms goat cheese, toasted pine nuts and a sherry vinaigrette. I then roasted two huge trays of vegetables – yellow squash, zucchini, Portobello mushrooms, eggplant, Vidalia onions, smashed whole garlic cloves (from Ethel’s garden), red, and orange peppers and baby turnips – with Greek olive oil and French grey salt. I made a mass of steamed Jasmine rice, folded in Goya black beans (for protein) and for the non-vegetarians, I pan roasted 2 whole chickens seasoned with salt, pepper and Garam Masala. It was all really simple. 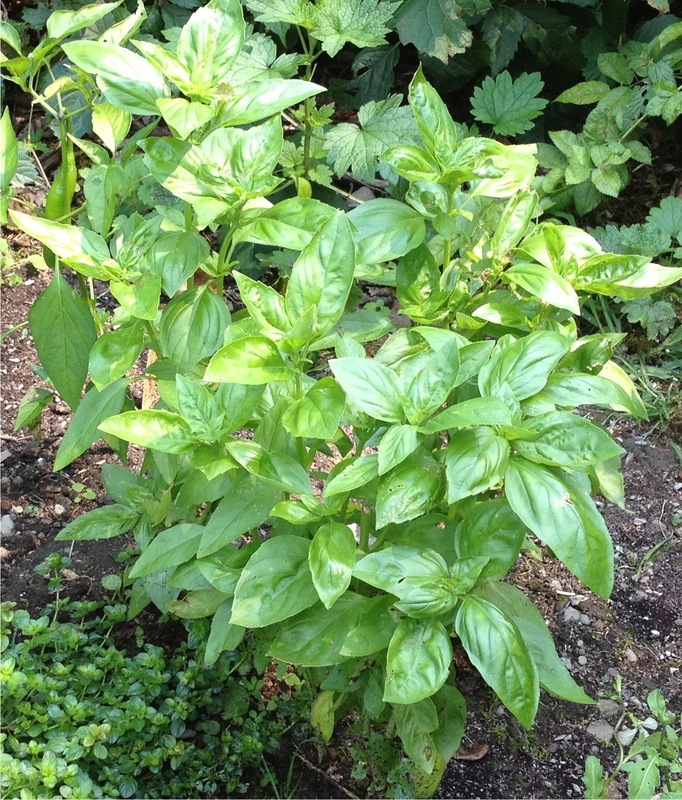 I also had made some basil pesto the night before from basil in my garden, picked on Monday. I decided to put some of that in a bowl and people spooned it on everything and even took some home! I was originally going to fold the pesto into the rice and beans but after taking a survey from everyone during the cocktail hour, we decided this was the way to go. A dollop on top on the vegetables was divine. Barbara asked for a batch as her Christmas present and Mary Beth took a container full home. People just wanted to eat it straight. I really never dreamed of that for pesto. 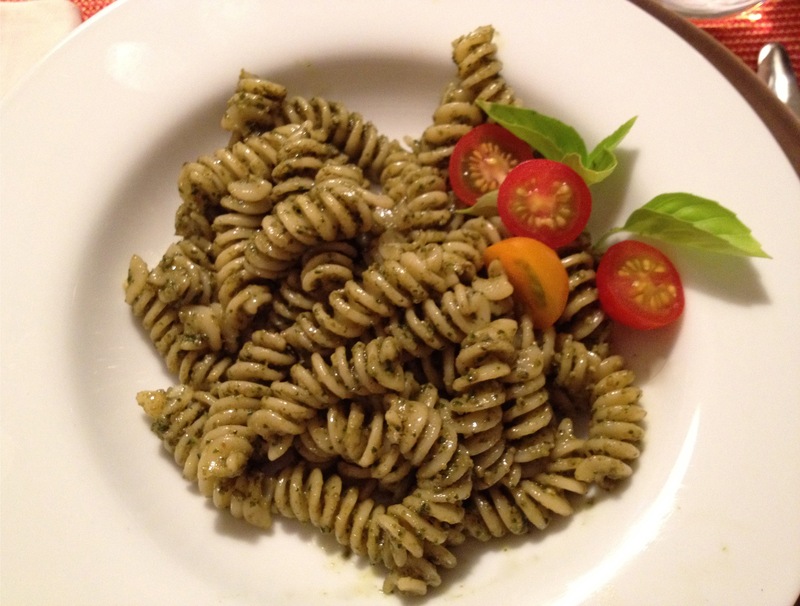 I just wanted to serve it because I had just made a bunch and with our youngest being in Europe, we couldn’t possibly eat it all, although pesto does freeze quite well. We finished the meal with a rhubarb crisp (really quick and easy to make) topped with a little scoop of vanilla ice cream. Not bad for a weeknight dinner party! 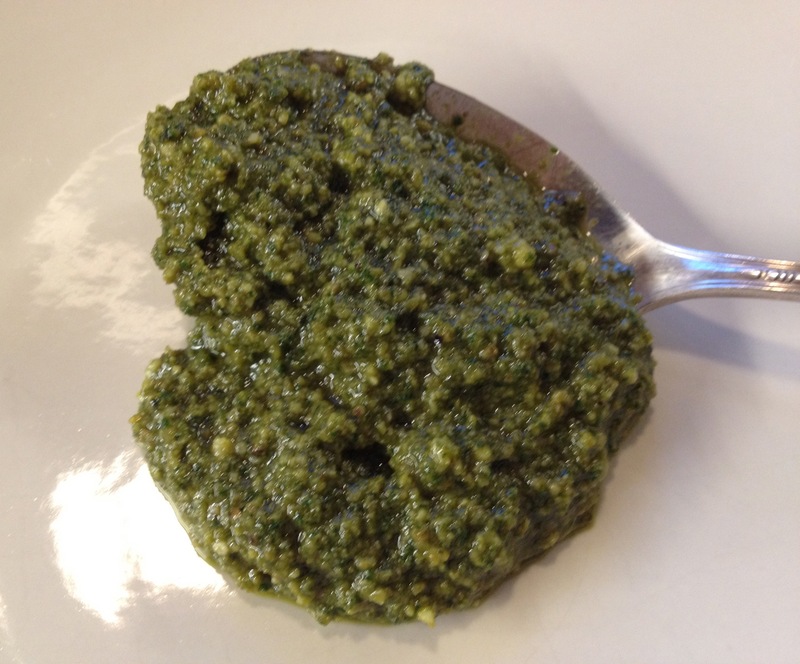 Here is the pesto recipe. Remember, it’s all about the quality of the ingredients for any dish you make, so use the very best you can. In a large food processor, combine basil, garlic and walnuts. Process to make a near paste. Scrape bowl. With machine on, slowly drizzle in olive oil. Scrape bowl again. Add the cheeses, a big pinch of salt and 20 grinds on fresh pepper. Process again, taste and add more salt, if necessary, to your liking. A one cup portion is enough to coat 1 lb. of dried pasta, cooked. I like it on fusilli best as it can get in all the little groves for maximum coverage and flavor. Dinner with our good friend, Nancy, on Saturday, started with this course.